Northcliff House's location in North Queensferry, overlooking the Forth bridges and close to the M90, makes Dunfermline, Edinburgh and Fife all easily and quickly accessible. Northcliff is located at the northern end of the Forth road and rail bridges, overlooking the village of North Queensferry. With quick and easy access to the M90 and nearby rail links at Inverkeithing and North Queensferry, Northcliff makes a great base for business people. 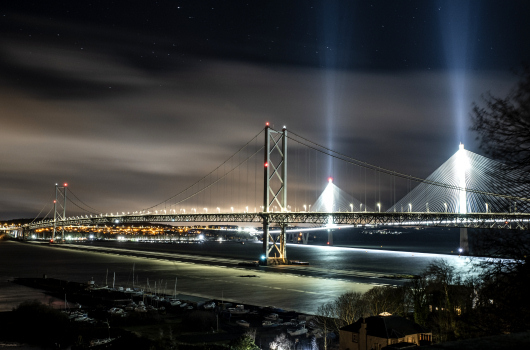 Dundee, Dunfermline, Edinburgh, Kirkcaldy, Perth, St Andrews and Stirling are all within easy reach by car or train, and Edinburgh Airport is also near at hand, providing access to both domestic and international destinations by air. Please refer to our information section for travel and driving directions. Use the controls to zoom in and out. You can move the map by clicking and dragging it with your mouse. Satellite and Street View are also available.